The UAE is no stranger to luxurious suites, with international hotels on every corner but we weren’t looking for just any suite, oh no, we were looking for something quite out of the ordinary, and that’s exactly what we found. For those that seek the quieter life from time to time, desperate for a hint of nature in the otherwise seemingly concrete jungle of Dubai and Abu Dhabi, you’d be hard pushed to find a more tranquil and beautiful location than the Eastern Mangroves. The spectacular mangroves in Abu Dhabi are a unique ecosystem of marine life coupled with spectacular scenery, they cover thousands of hectares of land along the shoreline and are a rich natural habitat for a variety of species. Their job is not only as a home to wildlife but also to protect the coastline by preventing erosion caused by waves and ocean currents, they even play a vital part in reducing carbon emissions which lessen the impact of climate change. Eastern Mangrove lagoon is the closest mangrove forest to Abu Dhabi city and is the perfect backdrop to the Anantara hotel which perches majestically along the waterfront. The hotel forms part of the marina and retail development and is a huge, imposing looking building in traditional Arabian design, with grand passageways and magnificently high arched ceilings. The hotel has over 200 rooms which for a property of its scale is actually quite few but we interested in the very best of these rooms. If you truly want to escape everything and everyone then why not invest in a weekend stay in a pool suite here, you truly need never leave your room. s of unrivalled luxury. There are only four of these suites available so booking in advance is essential. Decorated in iconic Anantara design, lots of dark wood and buttery yellow furnishings, the suite is impeccable with every detail well thought out. The living area seems to go on forever seamlessly blending into the bedroom and then outside onto the terrace. Even the swirly patterns on the carpet reflect the famed mangroves themselves. The bedroom complete with king size bed, huge flat screen TV and entertainment system is the perfect accompaniment to a weekend of relaxing, you can even order in which pillow you’d prefer should you wish. I opted for a dreamy aromatherapy infused version that sent me off into a blissful slumber in no time. The living area and separate dining room are great if there are more than 2 people staying otherwise you could find yourself rattling around in the enormous space. The very highlight of the Mangroves Pool Suite however is of course, the private plunge pool and cabana, its worth every dirham. Your bedroom leads off through double sliding doors onto the terrace which features your very own plunge pool shaded by a cabana, sun loungers and table and chairs overlooking the waterways, it’s idyllic and perfect for those that want their privacy. The views are unspoilt yet you don’t see another soul and if you do get a glimpse of an upstairs neighbour, simply pull the drapes around and once again you’re in your own private hideaway. If you do want to leave the suite and we suggest at some point you do, the hotel has a lot to offer. From a small pool central pool area to great places to dine. We tried Pachaylen, the signature Thai restaurant at the hotel which served up the most delectable authentic tastes of Thailand on an extensive set menu. The open kitchen added to the overall casual yet stylish design of the restaurant with rich, regal tones of gold and purple making up the majority of the interior. Enjoy traditional Thai curries or freshly caught seafood infused with spices to give it a traditional Thai kick. We have to personally recommend the Gaeng Massaman Lamb, a delicious slow cooked lamb shank in a massaman curry sauce served with sweet potato and shallots. The breakfast options are slightly limited apart from the usual omelettes and croissants so we recommend dining in your amazing suite if you can. If you get a chance you absolutely must try the Anantara Spa, easily one of the most lavish in the entire UAE. Tucked away down a quiet corridor, with an opening of a door you are transported into a serene oasis. Treat yourself to the Royal Ottoman Hamman, an hour worth of being scrubbed, buffed and cleaned to perfection. The Turkish Hammam is a beautiful, grand room with an ornate skylight keeping the marble just the right temperature. The treatment beings with a full body scrub which leads into a traditional foam bubble massage. You’re then covered in a replenishing honey and sesame seed body mask which leaves your dehydrated skin smooth as a babies. To regulate your body temperature you are doused in ice-cold water which isn’t actually as horrendous as it sounds and after 60 minutes of sauna, steam and body polishing it’s actually rather welcome. We promise you that you’ll leave feeling brand new. 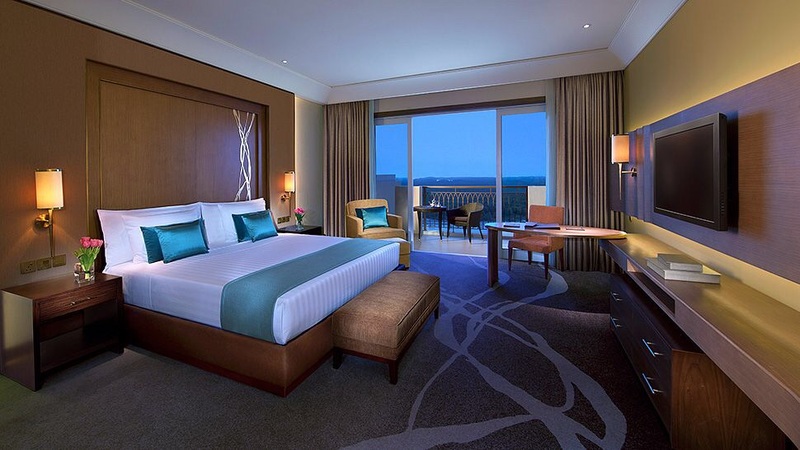 One things for sure Eastern Mangroves Hotel & Spa by Anantara does the brand name proud, the Pool Suite is a haven of privacy and the location makes this hotel stand out in a market saturated with options. A true weekend break if ever we’ve experienced one. Looks stunning. The modern design is very appealing!